Belamcanda chinensis, a medicinal flowering perennial of Chinese origin, belongs to the Iridaceae family. The rhizome of Belamcanda chinensis has been shown to possess antitussive, anti-inflammatory and expectorant activities; and is used in Chinese traditional medicines to treat throat ailments such as tonsillitis and asthma . Recent studies show that Belamcanda chinensis contains abundant isoflavonoids, which have significant antiviral and anti-inflammatory properties. Clinically, these extracted isoflavonoids are used for the treatment of influenza and upper respiratory tract infections . It has been previously reported that tectoridin and iridin along with their respective glycosides tectorigenin and irigenin can be isolated from the rhizome of Belamcanda chinensis . Moreover, studies have shown that these isoflavonoids and their glycosides are chemically active; and particularly, the glycosides possess the most potent pharmacological activity [2,4]. Moreover, it has been reported that orally administered tectoridin is converted into tectorigenin by human intestinal bacteria, which exhibited more potent anaphylaxis inhibitory activity and hypoglycemic activity compared with tectoridin [5,6]. In our previous study, we reported that tectoridin in the role of intestinal flora can turn for tectorigenin, and iridin turn for irigenin, tectorigenin and irigenin in gastric and duodenal absorption were good in the corresponding glycosides compounds . Previous studies have shown that Belamcanda chinensis extract inhibited xylene-induced swelling of mouse ear and egg white-induced hind paw edema in rats, suggesting its potent anti-inflammatory activity in vivo . However, this study investigated only the effects of Belamcanda chinensis extract, and not the monomer compounds present in the extract. Moreover, the anti-inflammatory mechanism associated with these monomeric compounds has not been previously explored. Tectorigenin and irigenin, isolated from the rhizomes of Belamcanda chinensis are used as Chinese traditional medicine for the treatment of throat diseases. Lipopolysaccharide (LPS)-activated macrophages have typically been used to evaluate the anti-inflammatory effects of numerous drugs. LPS stimulate macrophages; the cells will produce large amounts of Nitric Oxide (NO) and Prostaglandin E2 (PGE2), which are catalysed by Nitric Oxide Synthase (NOS) and Cyclooxygenase (COX) respectively. Tumor Necrosis Factor-alpha (TNF-α) and Interleukin-6 (IL-6) are important cytokine induced by LPS, involved in the inflammatory reaction process . IL-6 is an intrinsic mediator of LPS-induced fever in the body and a major factor in the induction of inflammatory responses. It can promote the differentiation of T lymphocytes and B lymphocytes amplify inflammatory reactions in cascades and cause damage to tissues . The level of IL-6 can be used to determine the severity of inflammatory response to the sensitive indicators . TNF- can mediate multi-inflammatory and immune response; the expression level can directly reflect the severity of inflammation . The study found that the body by the LPS stimulation, the heart, liver, uterus and fallopian tubes and other organs quickly a large number of synthetic TNF-α, neutrophil chemotaxis strengthened, and then mediated the occurrence of inflammatory response . When the body is stimulated by LPS, macrophages can activate and release a variety of cytokines, including IL-6, TNF-a, these cytokines can further activate the body's endothelial cells release oxygen free radicals, accelerate the metabolism of arachidonic acie and release prostaglandins, leukotriene and other inflammatory mediators, cause or aggravate the inflammatory response. In the present study, we investigated the potential anti-inflammatory effects of tectorigenin and irigenin on the production of NO, IL-6, PGE2 and TNF-α as well as the expression of COX-2 and iNOS protein in LPS-stimulated RAW264.7 macrophages. Furthermore, we also analysed the cytotoxic effects of these isoflavonoids on murine macrophages. Tectorigenin and irigenin [>98% purity with High-Performance Liquid Chromatography (HPLC)] were purchased from Chengdu Biopurify Phytochemicals Ltd (Sichuan, China). The tectorigenin and irigenin were dissolved in (Dimethylsulphoxide) DMSO respectively as final concentration, and stored at -20°C until further use. LPS (Escherichia coli strain O55:B5) and 3-(4, 5-dimethylthiazol-2-yl)-2, 5- diphenyltetrazolium bromide (MTT) reagent were purchased from Sigma Aldrich (St. Louis, MO, USA). Primary antibodies for iNOS and COX-2 were purchased from Abcam (Cambridge UK). The secondary goat anti-rabbit antibody was purchased from ComWin Biotech Co., Ltd (Beijing, China). Enzyme- Linked Immunosorbent Assay (ELISA) kits for IL-6, PGE2 and TNF-α were obtained from Nanjing Jiancheng Bioengineering Institute (Nanjing, China). Cell lysis buffer for Western, Bicinchoninic Acid (BCA) protein assay kit and nitrite assay kit were purchased from Beyotime (Haimen, China). RAW264.7 murine macrophages were purchased from the Type Culture Collection of the Chinese Academy of Sciences (Shanghai, China). Cells were cultured in Dulbecco’s Modification of Eagle’s Medium (DMEM) (Corning, Manassas,VA20109, USA) supplemented with 10% Fetal Bovine Serum (FBS) (Corning, Manassas,VA20109, USA) and antibiotics (100 U/ml penicillin and 100 U/ml streptomycin; Tianjinghaoyang, Tianjing, China) at 37°C in a humidified incubator with 5% CO2. Cell viability was assessed using MTT assay. Briefly, RAW264.7 macrophages (1 × 105 cells/ml) were seeded in a 96 well plates. After 24 h, cells were treated with different concentrations of Tectorigenin (0-64 μg/ml) or Irigenin (0-176 μg/ml) for 1 h, with or without LPS (2 μg/ml) incubated for additional 24 h. The cell culture supernatants were removed, and MTT (5 mg/ml in PBS) was added to each well. The macrophages were incubated for 4 h at 37°C. The supernatants were discarded, and DMSO (Dikma, USA) was added to each well. The optical density of the resulting solutions was measured at 490 nm using a microplate reader (BioTek Elx800, USA). The presence of NO in the culture supernatant was determined based on the Griess test (Beyotime, China). RAW264.7 macrophages (1 × 106 cells/ml, 96-well plate) were pre-treated with tectorigenin (8, 16, and 32 μg/ml) or irigenin (22, 44, and 88 μg/ml) for 1 h before LPS (2 μg/ml) stimulation . After 24 h incubation, the culture supernatants were collected for NO determination using the Griess reagent. The absorbance was read at 550 nm using a microplate reader, and NO concentrations were calculated with reference to the nitrite standard curve generated using NaNO2-. RAW264.7 macrophages (1 × 106 cells/ml) were cultured for 24 h in 96-well plates. The cells were pretreated with tectorigenin (8, 16, and 32 μg/ml) or irigenin (22, 44, and 88 μg/ml) for 1 h, and then induced by LPS (2 μg/ml) for 24 h. The concentrations of IL-6, PGE2, and TNF-α in the supernatants were measured using ELISA kits, according to the manufacturer’s protocol. RAW264.7 macrophages were cultured in tissue culture flasks for 24 h at a seeding density of 1 × 106 cells/ml. The macrophages were pre-treated with tectorigenin (8, 16, and 32 μg/ml) or irigenin (22, 44, and 88 μg/ml) for 1 h, and then stimulated with LPS (2 μg/ml) for 24 h. Following incubation, cells were washed twice with ice-cold Phosphate Buffer Saline (PBS), and lysed with cold lysis buffer, for 30 min on ice. The cell extracts were then centrifuged at 14,000 r/min, 4°C for 15 min, and the resulting supernatant containing cellular protein was collected and stored at -80°C. Total protein was quantified using a BCA protein assay kit (Beyotime, China). Protein extracts were separated by Sodium Dodecyl Sulfate Polyacrylamide Gel Electrophoresis (SDS-PAGE) and electrophoretically transferred to Polyvinylidene Fluoride (PVDF) membranes (Millipore, Billerica, MA, USA). Membranes were incubated in 5% non-fat milk blocking buffer in PBS at room temperature for 1 h. INOS and COX-2 primary antibodies were added at 1:200 dilution in non-fat milk blocking buffer in PBS, and incubated overnight at 4°C. Following washes in PBS, the membranes were incubated in secondary antibody (1:1000) at room temperature for 1 h. The protein bands were detected utilizing the eECL western Blot kit (Cwbio, China). β-actin was used as a loading control to normalize differences in loading of the proteins. Densitometric values of the immunoblot signals were obtained with Image J (National Institutes of Health, USA). The results were expressed as Mean ± SD. Differences between the mean values of normally distributed data were assessed by the one-way ANOVA. P ≤ 0.05 was considered statistically significant. The cytotoxic effects of tectorigenin and irigenin on RAW264.7 macrophages were investigated. The cells were treated with varying concentrations of tectorigenin (8, 16, 32 μg/ml) or irigenin (22, 44, 88 μg/ml) for 24 h, and the cell viability was determined by the MTT assay. The results demonstrated that the percentage of the cell viability remained nearly unaltered in treated cells compared with untreated control macrophages (Figure 1). The data suggested that neither tectorigenin (Figure 1A) nor irigenin exhibited cytotoxic effects on RAW264.7 macrophages (Figure 1B) at the indicated concentrations. Figure 1: Cytotoxicity of tectorigenin and irigenin on RAW264.7 macrophages. RAW264.7 cells were incubated with (A) Tectorigenin (8, 16, 32 μg/ml) and (B) Irigenin (22, 44, 88 μg/ml) for 24 h, following which, the MTT reagent was added. Cell viability was determined by measuring the absorbance at 490 nm. The results were expressed as a percentage of the control. The values are represented as the cell viability percentage calculated from the mean of 3 independent experiments. Statistical analysis was performed using one-way ANOVA. In order to determine the potential anti-inflammatory properties of tectorigenin and irigenin, we stimulated RAW264.7 cells with LPS (2 μg/ml) in the presence of tectorigenin (8, 16, 32 μg/ml) or irigenin (22, 44, 88 μg/ml). Accumulation of NO in the cell culture medium was quantified by the Griess reagent. As shown in Figure 2, LPS stimulation resulted in significantly increased NO production (0.779 ± 0.0293 μM) compared with the control unstimulated macrophages (0.015 ± 0.0073 μM). Interestingly, treatment with tectorigenin and irigenin led to a dose-dependent decrease in this accumulated NO (P<0.05). The results indicated that these isoflavonoids exert anti-inflammatory effects in the murine macrophages by inhibiting NO production and accumulation. 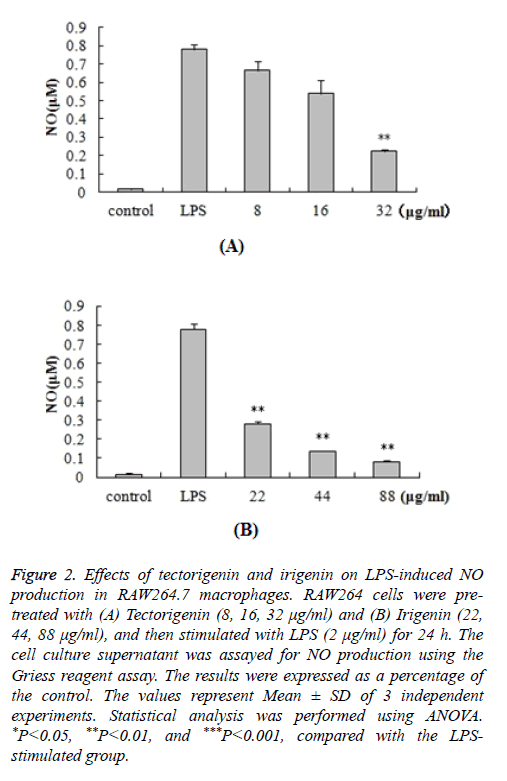 Figure 2: Effects of tectorigenin and irigenin on LPS-induced NO production in RAW264.7 macrophages. RAW264 cells were pretreated with (A) Tectorigenin (8, 16, 32 μg/ml) and (B) Irigenin (22, 44, 88 μg/ml), and then stimulated with LPS (2 μg/ml) for 24 h. The cell culture supernatant was assayed for NO production using the Griess reagent assay. The results were expressed as a percentage of the control. The values represent Mean ± SD of 3 independent experiments. Statistical analysis was performed using ANOVA. *P<0.05, **P<0.01, and ***P<0.001, compared with the LPSstimulated group. We further investigated the anti-inflammatory effects of tectorigenin and irigenin on the production of cytokines. RAW264.7 macrophages were pre-treated with tectorigenin (8, 16, and 32 μg/ml) or irigenin (22, 44, and 88 μg/ml), and then stimulated with LPS (2 μg/ml) for 24 h. The cell culture supernatant was then assayed for the levels of IL-6, PGE2 and TNF-α using ELISA. As shown in Figure 3, LPS stimulation caused significant increase in the protein levels of IL-6, PGE2 and TNF-α compared with the unstimulated control cells (P<0.05). However, pre-treatment with tectorigenin and irigenin significantly decreased IL-6, PGE2 and TNF-α secretion in LPS stimulated murine macrophages (P<0.05). The data demonstrate that the protein levels of IL-6, PGE2 and TNF-α induced by LPS were dose-dependently downregulated by tectorigenin and irigenin. Figure 3: Effects of tectorigenin and irigenin on LPS-induced secretion of IL-6, PGE2 and TNF-α in RAW264.7 macrophages. RAW264.7 cells were pre-treated with Tectorigenin (8, 16, and 32 μg/ml) or Irigenin (22, 44, and 88 μg/ml), and then stimulated with LPS (2 μg/ml) for 24 h. (A, B) IL-6, (C, D) PGE2 and (E, F) TNF-α production in the cell culture supernatant was measured using ELISA. The results were expressed as a percentage of the control. Data represent the Mean ± SD of 3 independent experiments. Statistical analysis was performed using one-way ANOVA. *P<0.05, **P<0.01, and ***P<0.001, compared with the LPS-stimulated group. We further aimed to study the inhibitory mechanism of NO and PGE2 production in LPS-stimulated murine macrophages by analyzing the expression of iNOS and COX-2. RAW264.7 macrophages were pre-treated with tectorigenin (8, 16, and 32 μg/ml) or irigenin (22, 44, and 88 μg/ml), and then stimulated with LPS (2 μg/ml). The expression levels of iNOS and COX-2 in the cell lysates were detected by Western blotting. As shown in Figure 4, the unstimulated control cells had almost undetectable levels of iNOS and COX-2; LPS stimulation led to a notable increase in the expression of these inflammatory mediators. Furthermore, pre-treatment with tectorigenin resulted in decreased iNOS and COX-2 expression, with maximum suppression occurring at 32 μg/ml (Figure 4A). Similar results were obtained when the macrophages were treated with irigenin prior to LPS stimulation (Figure 4B). 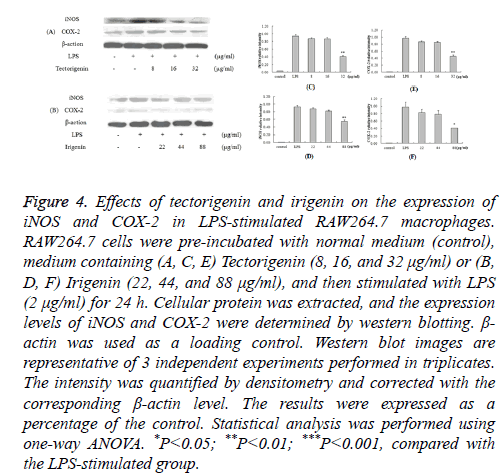 Figure 4: Effects of tectorigenin and irigenin on the expression of iNOS and COX-2 in LPS-stimulated RAW264.7 macrophages. RAW264.7 cells were pre-incubated with normal medium (control), medium containing (A, C, E) Tectorigenin (8, 16, and 32 μg/ml) or (B, D, F) Irigenin (22, 44, and 88 μg/ml), and then stimulated with LPS (2 μg/ml) for 24 h. Cellular protein was extracted, and the expression levels of iNOS and COX-2 were determined by western blotting. β- actin was used as a loading control. Western blot images are representative of 3 independent experiments performed in triplicates. The intensity was quantified by densitometry and corrected with the corresponding β-actin level. The results were expressed as a percentage of the control. Statistical analysis was performed using one-way ANOVA. *P<0.05; **P<0.01; ***P<0.001, compared with the LPS-stimulated group. Belamcanda chinensis is a common traditional Chinese medicine, which is mainly used for the treatment of respiratory system disorders, including bronchial asthma, tonsillitis and infantile cough. Isoflavonoids such as tectorigenin and irigenin isolated from the rhizome of Belamcanda chinensis have been widely investigated. These isoflavonoids have recently been shown to possess not only anti-inflammatory and antioxidative, but also antitumor activities [2,15]. Several studies have reported the chemical, composition and pharmacological effects of tectorigenin and irigenin, but few are about their anti-inflammatory mechanisms. The aim of our present study was to elucidate the possible anti-inflammatory functions of tectorigenin and irigenin. Bacterial infections initiate inflammation via numerous interconnecting mechanisms. Activation of the immune cells by bacterial pathogens lead to increased expression of immune response mediators, such as iNOS, COX-2 and pro-inflammatory cytokines (e.g. tumor necrosis factor (TNF)-α and IL-1β). Particularly, activated macrophages upregulate the activity of iNOS, thereby generating large amounts of NO. Increased expression of NO as well as pro-inflammatory cytokines has been linked to several inflammatory diseases like inflammatory bowel disease, rheumatoid arthritis, etc. [16,17]. Also, the cytokines IL-6 and TNF-α are found to be elevated in almost all inflammatory conditions, and therefore utilized as therapeutic targets . It has been reported that both tectorigenin and irigenin inhibit LPS-induced NO production as well as the expression of iNOS and COX-2 proteins in murine macrophages [18,19]. In this study, we demonstrated that LPS stimulation of murine macrophages not only increased the expression of iNOS and COX-2, but also the production of NO. Interestingly, pre-treatment with tectorigenin and irigenin potently reversed the effects of LPS, and led to a dosedependent decrease in these inflammatory mediators. Moreover, we also found that tectorigenin and irigenin do not exert cytotoxic effects on RAW264.7 macrophages even up to a concentration of 64 μg/ml and 176 μg/ml, respectively. In addition, downregulation of iNOS protein by these isoflavonoids was in accordance with the inhibition of NO production, indicated that tectorigenin and irigenin partially blocked NO production by inhibiting the induction of iNOS. Our data was in line with previously reported studies, which showed that tectorigenin and irigenin decreased the expression of NO, iNOS and COX-2. TNF-α and IL-6 are important proinflammatory cytokines, and in normal physiological conditions of the lower level, in the systemic inflammatory response syndrome and other inflammatory pathological conditions significantly increased. TNF-α is an early inflammatory factor, which can induce various chemokines, intercellular adhesion molecules, vascular adhesion molecule production, promote leukocyte accumulation in the inflammatory site, and neutrophil respiratory burst. In addition, TNF-α can also activate the NF-κB pathway, iNOS and COX-2 and other proinflammatory enzyme expression, and NO, PGE2 and inflammatory cytokine production, amplification of inflammatory response, eventually leading to Tissue Inflammation . IL-6 can promote B cell differentiation and activation of Mitogen Activated Protein Kinase (MAPK), the activation of signal transducer and activator of transcription and aggravate the inflammatory reaction process [21,22]. Therefore, inhibiting the excessive secretion of TNF-α and IL-6 induced inflammatory cytokines can improve the inflammatory response and reduce the body tissue damage, which has potential clinical application value. The results showed that LPS stimulated RAW264.7 macrophages to secrete large amounts of TNF-α and IL-6, while tectorigenin and irigenin can be concentration-dependent reduction of LPS induced TNF-α and IL-6 production . All above suggesting that iris flavonoids and wild iris flavin played an anti-inflammatory effect by inhibiting TNF-α and IL-6 and other pro-inflammatory cytokines. The data from the present study helps to identify the traditional use of Belamcanda chinensis in the development of new therapeutics for inflammatory disorders. However, further studies are warranted to investigate the downstream signal transduction pathways resulting in the inhibition of inflammatory mediators, including NO, iNOS, and COX-2 by tectorigenin and irigenin. In summary, our data demonstrate that tectorigenin and irigenin potently inhibit LPS-induced production of NO, IL-6 and TNF-α as well as iNOS and COX-2 expression. In addition, these plant-derived isoflavonoids exhibit no cytotoxic effects on murine macrophages. Our results suggest that both tectorigenin and irigenin possess anti-inflammatory functions, and may provide an alternative strategy for reducing inflammation. We are grateful to the members of Li Guoxin teaching and research team for their expert guidance. This work was supported by grants from the National Natural Science Foundation of China (No. 81273927). Ito H, Onoue S, Yoshida T. Isoflavonoids from Belamcanda chinensis. Chem Pharm Bull (Tokyo) 2001; 49: 1229-1231. Xin RH, Zheng JF, Cheng L, Peng WJ, Luo YJ. Belamcanda chinensis (l. ) Dc: Ethnopharmacology, phytochemistryand pharmacology of an important traditional Chinese medicine. Afr J Trad Compl Alt Med 2015; 12: 39-70. Qiu YK, Gao YB, Xu BX, Liu K. Isolation and Identification of isoflavonnoids from Belamcanda chinensis. Zhongguo Yaowu Huaxue Za Zhi 2006; 16: 175-177. Kang KA, Lee KH, Chae S, Zhang R, Jung MS, Kim SY, Kim HS, Kim DH, Hyun JW. Cytoprotective effect of tectorigenin, a metabolite formed by transformation of tectoridin by intestinal microflora, on oxidative stress induced by hydrogen peroxide. Eur J Pharmacol 2005; 519: 16-23. Bae EA, Han MJ, Lee KT, Choi JW, Park HJ, Kim DH. Metabolism of 6?-O-xylosyltectoridin and tectoridin by human intestinal bacteria and their hypoglycemic and in vitro cytotoxic activities. Biol Pharm Bull 1999; 22: 1314-1318. Park EK, Shin YW, Lee HU, Lee CS, Kim DH. Passive cutaneous anaphylaxis-inhibitory action of tectorigenin, a metabolite of tectoridin by intestinal microflora. Biol Pharm Bull 2004; 27: 1099-1102. Wang GH, Jiang H, Meng l, Zou GX. Studies on the absorption kinetics of Belamcanda chinensis extract in rat gastrointestinal. Liaoning Zhongyi Za Zhi 2013; 40: 1023-1025. Li GX, Qin WY, Qi Y, Chen H, Zhao JM. The anti-inflammatory and analgesia experiment research of the Belamcanda Chinese extract. Shiyong Zhongyi Neike Za Zhi 2008; 22: 3-4. Villa V, Thellung S, Bajetto A, Gatta E, Robello M, Novelli F, Tasso B, Tonelli M, Florio T. Novel celecoxib analogues inhibit glial production of prostaglandin E2, nitric oxide, and oxygen radicals reverting the neuroinflammatory responses induced by misfolded prion protein fragment 90-231 or lipopolysaccharide. Phamacol Res 2016; 113: 500-514. Lag M, Rodionov D, Ovrevik J, Bakke O, Schwarze PE, Refsnes M. Cadmium-induced inflammatory responses in cells relevant for lung toxicity: Expression and release of cytokines in fibroblasts, epithelial cells and macrophages. Toxicol Lett 2010; 193: 252-260. Reinhart K, Menges T, Gardlund B, Harm Zwaveling J. Randomized, placebo-controlled trial of the anti-tumor necrosis factor antibody fragment afelimomab in hyperinflammatory response during severe sepsis: The RAMSES Study. Crit Care Med 2001; 29: 765-769. Maini SR. Infliximab treatment of rheumatoid arthritis. Rheum Dis Clin North Am 2004; 30: 329-347. Yokoyama T, Vaca L, Rossen RD, Durante W, Hazarika P, Mann DL. Cellular basis for the negative inotropic effects of tumor necrosis factor-alpha in the adult mammalian heart. J Clin Invest 1993; 92: 2303-2312. Kim YP, Yamada M, Lim SS, Lee SH, Ryu N. Inhibition by tectorigenin and tectoridin of prostaglandin E2 production and cyclooxygenase-2 induction in rat peritoneal macrophages. Biochim Biophys Acta 1999; 1438: 399-407. Han S, Lee JH, Kim C, Nam D, Chung WS, Lee SG, Ahn KS, Cho SK, Cho M, Ahn KS. Capillarisin inhibits iNOS, COX-2 expression, and proinflammatory cytokines in LPS-induced RAW264.7 macrophages via the suppression of ERK, JNK, and NF-ĸB activation. Immunopharmacol Immunotoxicol 2013; 35: 34-42. Morrissey C, Bektic J, Spengler B, Galvin D, Christoffel V, Klocker H, Fitzpatrick JM, Watson RW. Phytoestrogens derived from Belamcanda Chinensis have an antiproliferative effect on prostate cancer cells in vitro. J Urol 2004; 172: 2426-2433. Heinrich PC, Behrmann I, Haan S, Hermanns HM, Müller-Newen G. Principles of interleukin (IL)-6-type cytokine signalling and its regulation. Biochem J 2003; 374: 1-20. Logotheti H, Pourzitake C, Tsaousi G, Aidoni Z, Vekrakou A, Ekaterini A, Gourgoulianis K. The role of exhaled nitric oxide in patients with chronic obstructive pulmonary disease undergoing laparotomy surgery-The noxious study. Nitric Oxide 2016; 61: 62-68. Ahn KS, Noh EJ, Cha KH, Kim YS, Lim SS, Shin KH, Jung SH. Inhibitory effects of Irigenin from the rhizomes of Belamcanda chinensis on nitric oxide and prostaglandin E2 production in murine macrophage RAW264.7 cells. Life Sci 2006; 78: 2336-2342. Pan CH, Kim ES, Jung SH, Nho CW, Lee JK. Tectorigenin inhibits IFN-gamma/LPS-induced inflammatory responses in murine macrophage RAW 264.7 cells. Arch Pharm Res 2008; 31: 1447-1456. Saini NK, Sinha R, Singh P, Sharma M, Pathak R, Rathor N, Varma-Basil M, Bose M. Mce4A protein of Mycobacterium tuberculosis induces proinflammatory cytokine response leading to macrophage apoptosis in a TNF-a dependent manner. Microb Pathogene 2016; 100: 43-50. Hodge DR, Hurt EM, Farrar WL. The role of IL-6 and STAT3 in inflammation and cancer. Eur J Cancer 2005; 41: 2502-2512.